Good morning – or good day- depending on where you at. Today’s update is all about trust… or who do you trust? We are also moving into the new month of our patreon campaign. A great way to support comics or other art projects. There is no obligations but there are some perks. In fact we had one lucky winner last month win an original copic piece of the Bean. I am giving away Free art each month to one lucky patreon. If you want to find out more about- just click the banner. On a side note- I just finished scripting chapter 18 so the next book of the series is all scripted (including the cameos that were kickstarter rewards for book 5). It was no easy challenge, but I think they all work where they need to be. It will be fun to see how those pages flesh out. Working on several pages this week. There is something exciting that color does for me as I push forward. It actually helps me see the pages as a finished project. This is good. I really enjoy where the story is going and it’s constantly changing. Adapting in it’s own way. The characters feel alive for me… weird, but it’s a reality. I will be posting the next copic give away in a couple of weeks – it will go on patreon first. If you are also interested I am also doing more commission work these days. Including copic commissions (copic markers on bristol board – the size is 9×13 at the moment) and these are usually just a character or creature… The price for one is a 100. Dragons seem to be the most popular at the moment. Thank you again for everything and being part of my ramblings and my world. 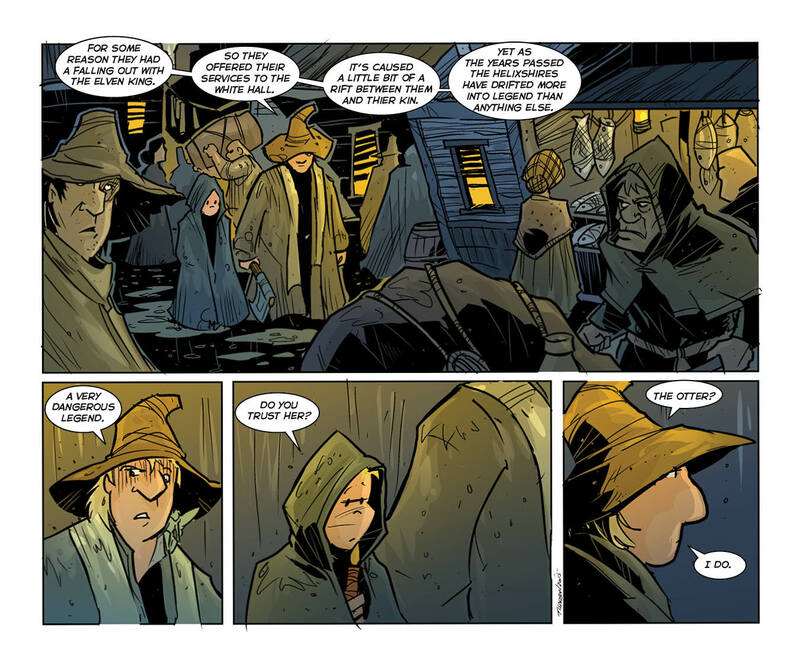 First panel, third text balloon – "their" rather than "thier". You got it right in the second text balloon. The last three panels faces are wonderfully, expressive. I'm so glad you're enjoying the coloring process. I am thoroughly enjoying the results especially in pages like this. The gloom of the night is more apparent with the warmth of the interiors as contrast. Lovely lovely stuff. wait til you see the next page- 🙂 and you right the results are sooooo much stronger.